Beginning in April 1863, Union officers began rounding up females suspected of providing aid and support to Confederate guerillas in the Western border region and placing them in makeshift jails in Kansas City. 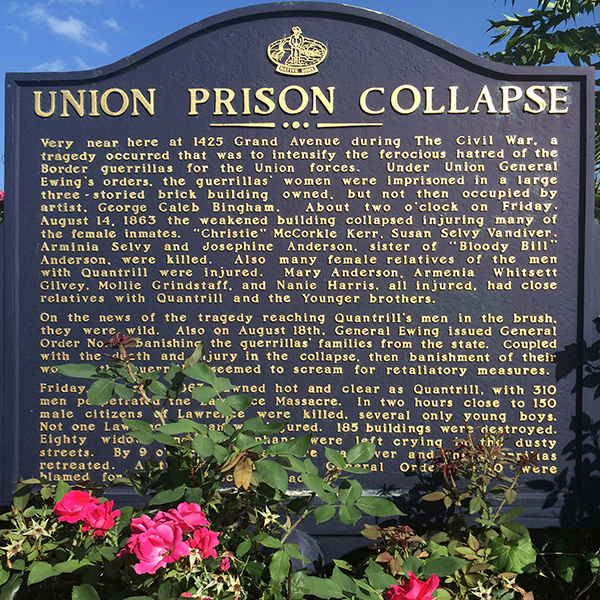 When one of these overcrowded prisons collapsed on August 13, 1863, it killed and maimed several female relatives of the guerrillas. Although the direct cause of the collapse remains unclear, it is certain that the disaster helped seal the fate of many men in Lawrence, Kansas, eight days later. After the humbling defeats of the previous summer at Independence and Lone Jack, and after watching the mounting casualties of the spring and summer of 1863, the Union command was desperate to enforce the peace, even if that meant the use of severe measures. Some men, such as Jim Lane, had long advocated removing all families loyal to the Confederacy from western Missouri, while others, such as George Caleb Bingham, had always urged the Union command toward restraint. Nonetheless, over the spring and summer of 1863, Union officers under orders from General Thomas Ewing began arresting women and girls suspected of aiding the pro-Confederate paramilitary bushwhackers. Some of these women and girls were arrested on the public roads and others were taken from the privacy of their home; all were held without bond or bail, awaiting transport and a trial in St. Louis. Some were caught red-handed with percussion caps, lead, and gunpowder, while others were arrested for having bolts of cloth known to be used for sewing guerrilla shirts. Some were suspected spies, some were caught with large stashes of cash thought to be suspicious, and still others were arrested to serve as hostages, only because they were known relatives of men living in the brush. The growing number of women and young girls awaiting transport to St. Louis for trial soon exhausted the safe and clean places that could house them in Kansas City. A seven-year-old, three-story building, incidentally belonging to the estate of painter George Caleb Bingham, was utilized to board some of the women and girls. They were housed on the upper floors, while their Union guards occupied part of the first story and cellar as an office and storage space. There is evidence that, in order to accommodate their use of the space, the Union guards removed some support columns and bricks from a foundation wall in the cellar. In this process they inadvertently undermined the building’s structural integrity. Witnesses reported that in a short time the floors began to sag, cracks appeared in the walls and ceilings, and plaster rained down on the first floor, coating everything with a fine layer of chalky dust. On the day of the collapse, an alarmed merchant who used a portion of the first floor space enlisted the aid of the guards to move his merchandise to safety in the middle of the street. The guards reported the imminent danger to their commanders, yet no order came to move the female prisoners from the dangerous building. View affidavits and other documents relating to the prison collapse. At around dinnertime, with 17 women and girls, one boy, and one guard on the second and third floors, the building abruptly collapsed. Four of the female prisoners were crushed and killed outright, and several others maimed or permanently crippled. Jenny, the youngest of the teenaged sisters of William T. “Bloody Bill” Anderson, who had been shackled to a bed for unruly behavior, suffered broken legs, lacerations, and a back injury. As a crowd gathered around the rubble and rescue operations began, cries of murder and whispers of a conspiracy surrounding the building’s collapse immediately began to circulate. The rumors and intrigue multiplied when drunken guards were overheard at a nearby tavern, bragging that they had caused the collapse on purpose by removing support columns in the cellar. An implausible counter-rumor that the women and girls were attempting an escape by tunneling to freedom further inflamed the growing controversy and added to the bitter feelings over the tragic event. View a clip of George Caleb Bingham, brought to life for "Meet the Past" at the Truman Memorial Building. When news of the building collapse and rumors of its cause reached the brush, the bushwhackers were enraged. Physical injury to women, especially white, Southern women, violated untold codes of honor, civility, and morality. Among the dead and wounded was 15-year-old Josephine Anderson, another sister of William T. Anderson. Led by William Clark Quantrill, along with Anderson and other notorious guerillas, the bushwhackers gathered for meetings at local farms and farmhouses to finalize their plans for an assault against the “Jayhawkers” that, with infamy, would fall upon the unsuspecting town of Lawrence, Kansas, on August 21, 1863. The attackers went on to cite revenge as a justification for their Sacking of Lawrence. Brownlee, Richard S. Gray Ghosts of the Confederacy: Guerrilla Warfare in the West 1861-1865. Baton Rouge: Louisiana State University Press, 1958. Leslie, Edward E. The Devil Knows How to Ride: The True Story of William Clarke Quantrill and His Confederate Raiders. New York: Random House, 1996. McCorkle, John. Three Years with Quantrill: A True Story. Norman, OK: University Press of Oklahoma, 1914.
why don't you have the courtesy of naming the women who died in the building collapse plus the ones who were permanently maimed? You name a few but leave out several. They are all entitled to have their name in this article so the name will not be forgotten for the brutal treatment they received by the Federal government. Several others managed to avoid injury. The Kansas City Star examined a number of possible explanations and accusations in an article posted online. This article was updated with factual corrections on October 12, 2015. I wonder why the plaque has the date wrong... Great article, thank you! !